All animals feed selectively. This book examines the selectivity of feeding from a variety of viewpoints. It examines the viewpoint of the behavioural ecologist that considers decision rules, the dietitian that looks at nutritional problems, and the community ecologist that sees feeding as a factor influencing species diversity. The text brings these diverse disciplines together to produce a coherent view of the way in which organisms 'choose' their diet. Optimal foraging theory has brought the study of foraging behaviour, particularly diet selection to a point where physiological, nutritional, psychological, morphological and ecological factors can begin to be addressed in a coherent fashion. 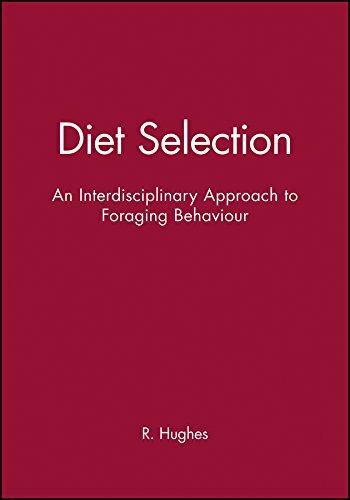 This book is not another exposition of optimal foraging theory, but it does draw on the applications and limitations of the theory to demonstrate the great potential for the development of diet selection as an interdisciplinary subject. R. Hughes is the author of Diet Selection: An Interdisciplinary Approach to Foraging Behaviour, published by Wiley. 1. Diet Selection: An Interdisciplinary Approach to Foraging Behaviour [Paperback] Hughes, R.
2. Diet Selection: An Interdisciplinary Approach to Foraging Behaviour [Paperback] Hughes, R.